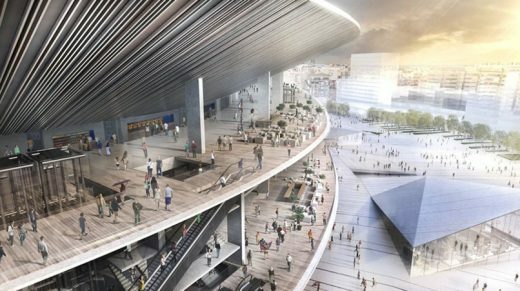 Japanese architecture practice Nikken Sekkei and Barcelona design studio Pascual i Ausió Arquitectes selected to renovate the Camp Nou stadium, home of FC Barcelona. The Nikken Sekkei + Pascual i Ausió Arquitectes proposal stands out for being open, elegant, serene, timeless Mediterranean and democratic. It is also notable for its relationship with the environment, providing depth, creating shadows and making members the stars of the facade and of the open area at all times. The proposal presents a very subtle attempt to intervene in the environment to facilitate circulation and achieve diverse urban usage in the Barça Campus and guarantees a clear and safe construction. 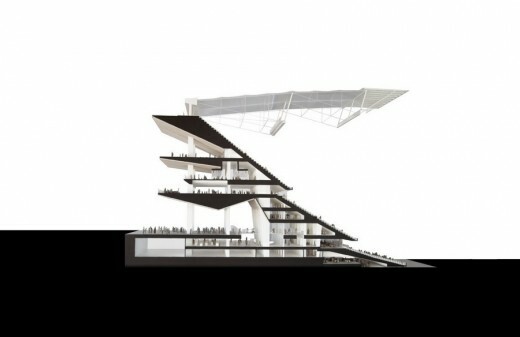 In short, it is a unique solution, reproducing the characteristic vision of the grandstand and canopy, from the inside out, a silent and powerful tribute to the stadium built by Francesc Mitjans in 1957. 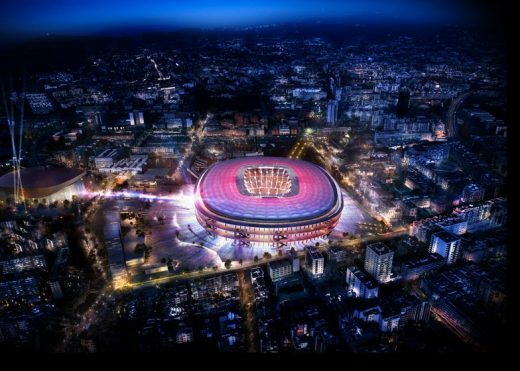 Last June 5 brought the start of the the International Architectural Tender to select the projects for the new Camp Nou and the new Palau Blaugrana. The bidding process began with the publication of the regulations and selection criteria. The tender was run over two phases and was conducted in collaboration with the Col·legi d’Arquitectes de Catalunya. The jury was made up of five members of FC Barcelona, four from the Board of Directors and one architect; three members of the Col·legi d’Arquitectes; and one representative of Barcelona City Council. The FC Barcelona members of the Espai Barça jury were Josep Maria Bartomeu, Susana Monje, Jordi Moix, Emili Rousaud and architect Juan Pablo Mitjans. The Col·legi d’Arquitectes de Catalunya (COAC) was represented by its dean Lluís Comeron, and architects Arcadi Pla and Joan Forgas, while the Council was represented by its assistant city planning manager, Aurora López. The first phase of the tender involved the pre-qualification of the different teams on the basis of the regulations and selection criteria. 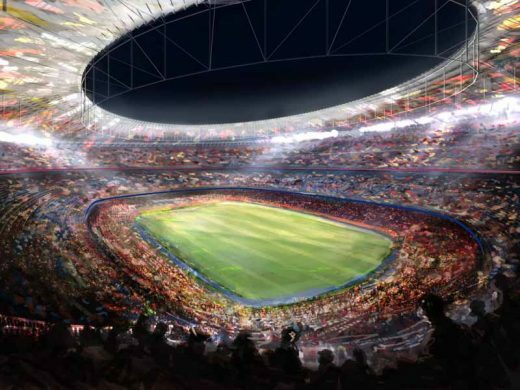 A total of 45 teams initially presented bids, 26 for the new Camp Nou and 19 for the new Palau, along with their credentials and evidence of their experience of similar projects. In September 2015, the Espai Barça jury and technical committee selected, from the original 26 candidatures, eight teams for the definitive tender for the Camp Nou. 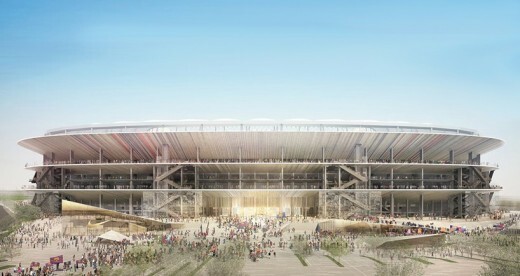 The teams had to be composed of one international studio and one local one, and had to base their proposals on the list of conditions published by the technical commission overseeing the tender, which was made up of the Espai Barça technical board, led by the director of the Patrimonial Area, William T. Mannarelli, and two architects from the Col·legi d’Arquitectes de Catalunya (COAC). The team formed by NIKKEN SEKKEI + Joan Pascual i Ramon Ausió Arquitectes has been selected ahead of bids by: AECOM + B720 Arquitectes, AFL + Mateo Arquitectura, Arup Sport + Taller d’Arquitectura Ricardo Bofill, BIG + IDOM + BAAS Arquitectes, GENSLER Sport + OAB, HKS + COX + Batlle i Roig Arquitectes, and POPULOUS + Mias Arquitectes + RCR Arquitectes. The presentation of the construction project of the New Camp Nou will be made at a public ceremony to be held in the coming weeks. The permanent exhibition of the Espai Barça, located in the Sala París, open to members and fans, and which was opened to coincide with the presentation of the New Palau Blaugrana, will be complemented by the winning project for the New Camp Nou. Thus, the exhibition will reveal in detail the proposed transformation of all the Club’s sports facilities. Since the Espai Barça Project exhibition opened on the Camp Nou Boulevard on 2 March, there has been a good reception among fans and members, with a total of 6,667 visitors through today at noon, including last weekend’s influx with three big games from FC Barcelona’s sections that were played at the Palau. Between Saturday and Sunday, a total of 4,844 people visited the exhibition, thanks to many of the spectators who attended the handball, hockey and basketball games that the Barça Lassa played who took the opportunity to learn about the Espai Barça project. The Japanese Nikken Sekkei company has been around for over 100 years and is one of Asia’s leading architectural and engineering studios. This company designed the Saitama Super Arena, the Big Swan Stadium in Niigata and the Tokyo Dome, all in Japan. This team is working with the Catalan studio headed by Joan Pascual and Ramon Ausió, who have a long and proven history of experience in Barcelona involving residential buildings, office blocks and hotels, such as Hotel Diagonal Zero.